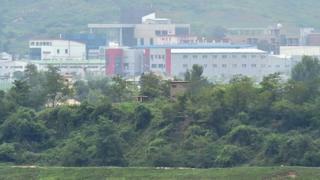 What is the Kaesong Industrial Complex? South Korea has suspended operations at a jointly run industrial park in North Korea following the North's recent rocket launch and nuclear test. The Kaesong Industrial Complex (KIC) is located inside North Korea just across the demilitarised zone from South Korea. The project was launched in 2004, largely financed by the South to increase co-operation. It is one of the last remaining points of peaceful engagement between North and South Korea, and is often seen as an indicator of relations between them. How did Kaesong come about? South Korea has said the purpose of the KIC was to develop an industrial park where South Korean companies could manufacture their products using North Korean labour. It argued that would help North Korea start to reform its economy, which is in a dire state, and ease tensions between the two Koreas. It was also seen as a way to encourage companies to keep production local rather than moving to China or other low-wage countries. Although it is a private venture, run by Hyundai Asan, part of the Hyundai Group, and the Korea Land Corporation (also a South Korean company), both governments are involved in the initiative. Companies have been given incentives by the South Korean government to move operations there, including political risk insurance to cover losses in their investment. All the goods made there are exported to South Korea for sale. The KIC is a duty-free zone, and there are no restrictions on the use of foreign currency or credit cards. No visa is required to enter the complex. What business is done there? A total of 124 companies currently operate in the KIC from industries including clothing and textiles, car parts and semiconductors. Some 54,000 North Korean workers are employed there as well as hundreds of South Korean workers, according to the Unification Ministry in Seoul. It is the biggest contributor to inter-Korean trade. If all the stages of development are completed as planned, it will eventually be half the size of Manhattan Island and will house shopping and residential areas, as well as tourism and recreation. How does North Korea benefit? South Korean companies pay about $100m (£69m) a year in wages to North Korean workers in the KIC, according to Yonhap news agency. The project as a whole has contributed almost $2bn in trade for North Korea, according to the Reuters news agency. However, if the project is threatened, South Korea also stands to lose. The government would be liable for hundreds of millions of dollars in insurance payments to the South Korean companies that use the complex. Has North Korea ever closed access to Kaesong before? Yes. In April 2013, the North shut down the complex for more than four months, after heightened tensions sparked by military drills by Seoul and Washington. Similarly in 2009, North Korean authorities imposed a number of restrictions on the KIC after US-South Korean military drills. Entry into KIC was shut for several days and hundreds of South Korean workers were effectively trapped. Some observers attribute a decline in production for the year to this incident. The restrictions were later relaxed, the border re-opened and demands that investors increase wages were dropped. However, for the most part the KIC has continued to operate and expand despite the frequent flare-ups of tension on the peninsula. It was not shut down in 2010, despite two violent incidents. A South Korean naval vessel, the Cheonan, was sunk in disputed waters, killing 46 sailors. Seoul says a North Korean torpedo sank the ship, but Pyongyang denies any role in the incident. Late in 2010, North Korean artillery units fired shells onto and around Yeonpyeong Island in disputed waters. Four South Koreans were killed, including two civilians. It was the first direct artillery attack since the 1950-1953 Korean war. South Korea responded by shooting shells at North Korea.